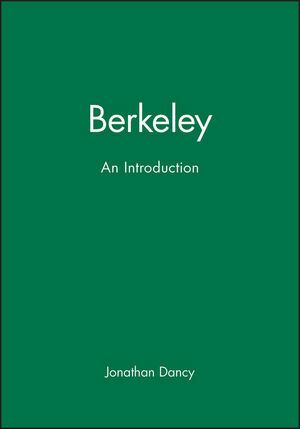 This new introduction to the main themes of Berkeley's philosophy assumes no previous knowlege of philosophy and will be accessible to first-year students and to the interested general reader. It also offers and defends its own interpretation of Berkeley' position. Jonathan Dancy argues that we understand Berkeley's idealism best if we take seriously his claim that realism (the view that material things have an existence independent of the mind) derives from a mistaken use of abstraction. Stress is laid on Berkelye's determination to use idealism to bring his God as close to us as possible. Instances of this are his claims that the world we live in is a collection of ideas in God's mind, and that natural events are divine utterances which science is the attempts to interpret. Dancy also discusses Berkelye's attack on the distinction between primary and secondary qualities, and his views on perception and knowledge. There is an account of his theory of the mind and of the nature of human action, and a final chapter contrasts the interpretation offered here with others. Students who have read this book will be well equipped to understand and assess the frequent references to Berkeley in current literature. Jonathan Dancy is Professor of Philosophy at the University of Reading and author of An Introduction to Contemporary Epistemology (Blackwell, 1985) and Moral Reasons (Blackwell, 1993), and editor of A Companion to Epistemology (with Ernest Sosa, Blackwell, 1992), Reading Parfit (Blackwell, 1997), and Normativity (Blackwell, 2000).